We’re careening at breakneck speed through downtown San Francisco, and things are getting a bit hairy. At the moment, we’re in the driver’s seat of a ZR1 Corvette, in hot pursuit of a criminal on the loose. Traffic is heavy and pedestrians are everywhere, which makes this high-speed chase pretty complicated. Despite our best efforts to weave through oncoming vehicles at 105 mph, we smash headfirst into a fire truck, sending glass and metal flying across the boulevard. Normally, our hopes would be dashed, and we’d simply hit the “reset” button and give it another go. Instead, though, we shift immediately into a Google Earth-style view of the entire Bay Area, spotting our prey moving on the map. The press of a button zips out of our mangled wreck and into an eighteen wheeler about 250 feet in front of our target. Quickly steering hard right, a massive barrier now blocks most of the street in front of our enemy. In another instant, we teleport out of the rig into a sweet Audi S5 Coupe trailing our baffled combatant, and crash into him a moment after he hits the truck head-on. Bad guy vanquished, mission accomplished. 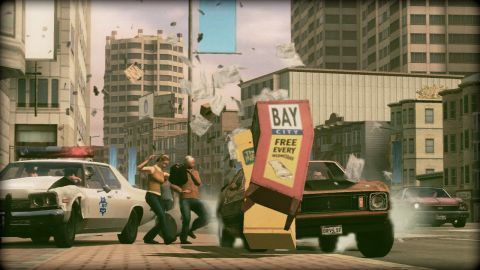 Such wildly entertaining chains of events are common in Driver: San Francisco. It’s one thing to combine the best parts of games like Burnout, Need for Speed, and Grand Theft Auto; it’s another to invent a new way to play a game in the tired driving-action genre. Frankly, we thought it was impossible to come up with something new, but the ability to “Shift” – the term Driver uses for being able to instantly teleport from the vehicle you’re in to any other one anywhere in the city at any time – is the sexiest new game mechanic we’ve seen in forever. It’s the kind of thing that doesn’t sound great on paper but makes perfect sense once you actually try it. It’s also a bit disconcerting, because we’ve been trained for so many years that there’s only one way to play driving games. Once it stuck in our minds, though, we started to wonder if we’d ever want to play a similar game any other way. We’re still not sure. Driver: San Francisco is like a great summer blockbuster movie (remember those?). It’s got tons of action, an over-the-top story that manages to keep your attention even as you roll your eyes, painfully cheeky banter between characters you learn to like and hate, and, oh yeah, tons of action. If you’re a longtime fan of the franchise, you already know our hero John Tanner and his arch-enemy Jericho; these two dudes were last seen battling it out in Driv3r several years back. If you’re new to the series, though, you can jump right in to the story without missing a beat. Characters are quickly introduced and the plot established, and from the word “go” it’s clear what’s happening. The story, broken up into eight chapters, takes place in and around a gorgeously realized San Francisco. The city is alive, teeming with traffic and pedestrians, and full of all the landmarks people familiar with the town will recognize. Each chapter charges you with accomplishing several missions, in whichever order you choose, as well as a bevy of side jobs that help earn extra cars and power-ups. The main storyline take place as Tanner and his sidekick piece together a mystery about Jericho. Of course, that many of these moments take place while Tanner is deep in a coma explains how the whole “Shift” concept gets conveniently established. You get to inhabit the bodies of cops, vigilantes, street racers, and other assorted San Francisco characters as they go on dozens of mayhem-producing escapades across the Bay Area. A nice variety of goals and objectives keeps the action fresh, and thanks to Shifting, there are plenty of ways to solve the same problem. As the story progresses, the real estate expands and the weirdness grows. We were never able to get too comfortable, as the tables got turned on us several times – another brilliant move that kept us guessing all the way to the end. There are a few incongruities, to be sure; Tanner is a good cop who’s bent on protecting the city, yet has no problem inhabiting the body of an innocent driver and ramming their vehicle into an enemy he’s chasing. That’s weird. Also, no matter how badly our Dodge Challenger got busted up, it was always bright, shiny, and in perfect working order at the start of every new mission. These are mere quibbles, though, with an otherwise dynamite single-player effort. The multiplayer modes are no mere afterthought, either – in fact, they’re arguably the most entertaining online driving we’ve done in ages. There are a dozen or so to choose from, but you have to unlock modes and options by leveling up. Whether we were playing “Tag” (whichever driver that can remain “it” for a pre-determined time wins, and whoever smashes into “it” gets to be “it”) or “trailblazer” (whichever driver can remain behind the pace car for the longest while driving at insanely high speeds in heavy traffic), we were shocked at how well the Shift mechanic worked in these races. Not only does it allow for an all-new level of strategy, it completely rewrites the rules of racing online – a wreck at an inopportune time no longer automatically relegates you to last place. Yes, there are a few regular racing modes too, but they feel tame compared to the Shift-powered ones. Even better, each mode (online and off) features over 100 real-world cars. While they don’t all exactly perform as they would in Gran Turismo, they’re different enough to get excited about. Driver: San Francisco blows our minds; it’s 100% more fun than we expected and immediately re-establishes the franchise front and center in the marketplace. It’s not often that a single new mechanic can reinvigorate an entire genre, but this one does. Here’s hoping it doesn’t get lost in the wave of fall releases that’s already upon us – it deserves your attention. You won’t be sorry.